More than just a Piano Man, Billy Joel is a living legend of the music industry with a catalogue of hit songs spanning more than 50 years. Anthony Mara has performed in every nook and cranny of this country for over 20 years, and now takes centre stage paying the ultimate tribute to one of his biggest influences in Billy Joel. Along with his full live band consisting of the finest musicians around, this powerful tribute show will thrill audiences with all the Billy Joel hits such as *Uptown Girl * Piano Man * She’s Always A Woman * A Matter Of Trust * Tell Her About It * It’s Still Rock & Roll To Me * Only The Good Die Young * You May Be Right * We Didn't Start The Fire * and many, many more! 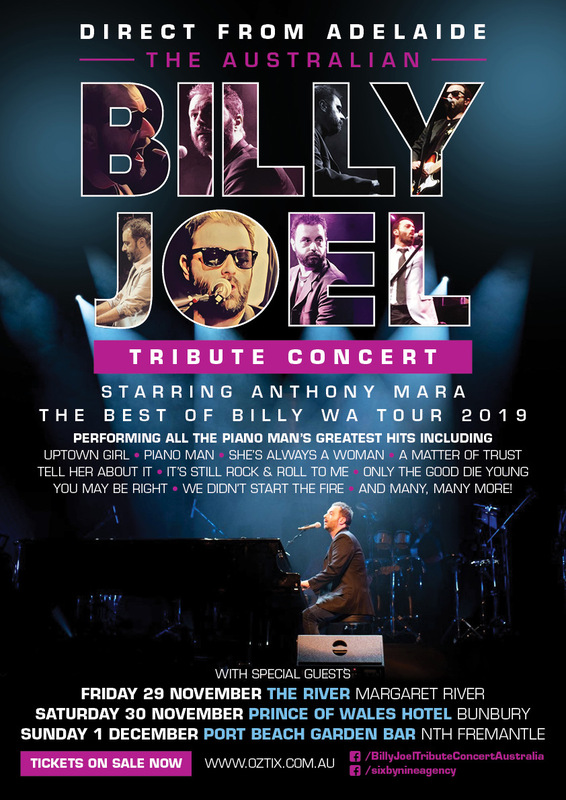 Following a sell-out theatre shows right across Australia in 2017 and 2018, Anthony Mara and his band return to WA in a more “Up Close & Personal” atmosphere that is set to thrill whilst having you singing and dancing to The Best Of Billy, taking you right into the world of Billy Joel in a concert event not to be missed!